Oregon has the most experience of any U.S. state with commercial marijuana. For many years before legalization, starting as early as the 1950s, surveys of Oregon found more marijuana use and cultivation than in any other western state. Mild climate and moderate rainfall in the Willamette Valley, which produces widely known orchard fruits and wines, also favored covert marijuana farming. In 1973, Oregon became the first state to decriminalize small amounts of marijuana: up to an ounce. By the 1980s, marijuana had become the state’s most valuable crop. In 1998, Oregon became the second state to legalize and regulate medical marijuana. In 2014, Oregon became the third state to legalize and regulate recreational marijuana, following Colorado and Washington two years before. Product trends: Quality and strength of marijuana in the United States evolved after early restrictions, starting with federal and state laws during the 1930s. Bulk “bricks” of a pound or two–common through the 1970s–were often smuggled from Central and South America. Strength was generally low. Delta-9-tetrahydrocannabinol (THC), the main euphoric, measured a few percent by weight in a mix of dried leaves, flowers and stems. Sinsemilla from only unfertilized flower buds–without seeds, leaves or stems–was unusual and costly. Processed marijuana began to capture U.S. trade during the 1980s and became a focus of consumer appeal. However, grade A sinsemilla needs greenhouses to protect against insects and fungus–optimized for light, temperature, moisture and nutrients. During decades of marijuana cultivation as a covert crop in Oregon, most producers look to have worked small, open-field plantings. Locally grown, grade B products overtook grade C imports and so far survive against industrialized, grade A products. Business trends: When presented the option of a legalized and regulated business in 2015, experienced Oregon growers mainly adapted and expanded open-field plantings, an annual crop cycle harvested in early fall. Out of about 2,000 producer licenses approved and in process, as of May, 2018, nearly two-thirds were for locations in only four of the 29 Oregon counties: Clackamas, Jackson, Josephine and Lane. They span lowlands east of the Coast Range mountains around Interstate 5, running from Portland south through Salem and Eugene to Medford. That is where about three-quarters of the state’s residents live. The first of the annual harvests after legalization, in 2016, shrank because of heavy rain, cold weather and hailstorms. The next year, nearly ideal weather provided a huge crop. The Oregon agency licensing marijuana operations has not published production and sales summaries. However, news writers claiming to have seen internal data say producers reported sales for 2017 of around 350,000 pounds against producer inventory, unsold in February, 2018, of more than a million pounds. Within a few months after the harvest, wholesale prices collapsed. Grade B product formerly selling at over $1,500 a pound was reported dumped at $100 a pound or less, when costs of production ranged above $200 a pound. Some growers say they are converting smokable marijuana into more stable extracts, hoping to sell medical and edible products. Retail shops that bought at last year’s prices are being whipsawed by competitors who waited and bought at fire-sale prices. Half the workers in the Oregon marijuana industry may be out of jobs. Desperate business owners are increasing covert exports to other states that legalization was expected to retard. This entry was posted in Business, History, Licensing, Public health on May 29, 2018 by Craig Bolon. This month–likely on Thursday, May 24–Brookline’s Town Meeting will vote on a risk-laden approach to marijuana zoning and licensing. A complex surface hides disorganized, hypocritical, neighborhood-hostile efforts. Two meetings on Thursday, May 10 showed confusions and lapses of community spirit: a review for some Town Meeting Members and a regular Advisory Committee meeting, both held at Town Hall. Recreational marijuana regulation: At the 2018 Annual Town Meeting starting May 22, under Articles 17 through 22 Brookline could allow up to four retail shops selling recreational marijuana and up to four marijuana cafes. The Planning Board and the Planning staff, supported so far by three of the five Select Board members, propose to allow the recreational marijuana shops in Local Business zones as well as in General Business zones. Brookline has five main General Business zones. They are mostly well separated from residential areas and schools: Commonwealth Avenue, Coolidge Corner, Brookline Village, Washington Square and the west end of Route 9 near the Chestnut Hill Mall. 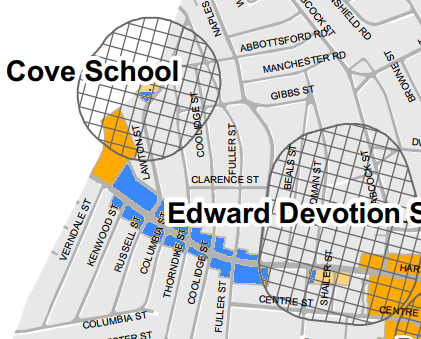 There are smaller ones near the north end of Harvard Street, bordered by Allston, and near the east end of Route 9, bordered by the Riverway. There are seven main Local Business zones. Many thread through residential areas and near schools: the shopping center near Putterham Circle in South Brookline, the northern part of Harvard Street between Devotion School and Verndale Street, the middle part of Harvard Street between Pierce School and Marion Street, the northern part of Cypress Street near Washington Street, the middle part of Cypress Street near the High School and Route 9, the southern part of Cypress Street near Kendall Street, the east end of Beacon Street between St. Mary’s and Carlton Streets, and land near the west end of Beacon Street around Sutherland Road. 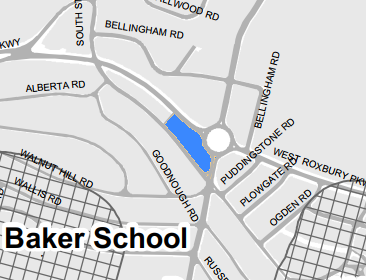 Threatened neighborhoods: Proposed zoning for marijuana includes so-called “buffer zones” extending 500 feet out from schoolyard boundaries. Marijuana shops are not allowed inside “buffer zones.” The maps that follow identify some of Brookline’s threatened neighborhoods–showing parts of Local Business zones outside “buffer zones.” Colored in bright blue are Local Business areas where marijuana shops would be allowed. 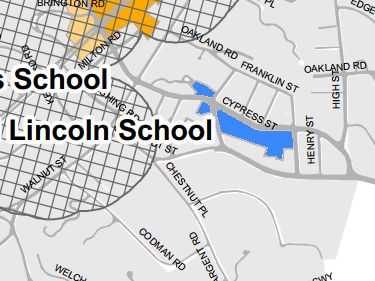 “Buffer zones” around schools are cross-hatched. Information from Town Hall: Planning staff held a late-afternoon information session at Town Hall on May 10, sought by Precinct 5 Town Meeting Members. The two staff were Francisco Torres and Ashley Clark–hired in part to develop and promote plans for marijuana. They have fairly short spans of experience in Brookline, and they smile a lot. At the Town Hall session were Betsy DeWitt–formerly a Select Board member–plus Phyllis O’Leary, Wendy Machmuller, Rob Daves, Andy Olins, Hugh Mattison and newly elected Cindy Drake from Precinct 5, John Bassett from Precinct 6, Craig Bolon from Precinct 8 and Regina Frawley from Precinct 16. Precinct 5 Town Meeting Members generally opposed medical marijuana at the former Brookline Bank on the corner of Route 9, High Street and Washington Street. They spoke about keeping marijuana shops out of the Local Business zones on Cypress Street. Betsy DeWitt saw high profits from marijuana shops pushing out ordinary local business. Planning has proposed no standards that support ordinary local businesses. Their proposals for zoning and licensing amount to a “first in the door” approach to zoning permits and business licenses. However, they propose no system to regulate how the timing of applications would be recognized. That could leave Brookline exposed to long and potentially costly “due process” lawsuits, claiming that results from its informal approach had been arbitrary and capricious. Advisory Committee hostile to neighborhoods: Many of the 24 out of 30 Advisory Committee members at the evening meeting on May 10 seemed hostile toward Brookline neighborhoods. Because around 60 percent of Brookline voters opted to legalize marijuana, they claimed recreational marijuana shops could be sited without considering impacts on neighborhoods. Fisher Hill resident Clifford Brown of Precinct 14 led a charge for more marijuana revenue, while several others on the committee chimed in. Voters blindsided: Many of the Brookline voters who opted to legalize marijuana had been informed by the cautious, two-year process to zone and license medical marijuana. Medical marijuana dispensaries are not allowed in Local Business zones. The only current one is on Route 9. Hardly anybody would have expected “full speed ahead” and “open floodgates” for recreational marijuana–the approach from Brookline Planning, welcoming both marijuana shops and cafes to the Local Business zones threading through residential neighborhoods and near schools. At Advisory Committee on May 10, vocal majorities rejected a motion to exclude marijuana shops from Local Business zones. They supported another motion to allow marijuana cafes. Hypocrites would continue to ban medical marijuana sales from Local Business zones, and they support a new ban on marijuana treatment centers. The outlook of hypocrites seems to be that medical marijuana would not yield as much in licensing fees and local taxes as recreational marijuana–so medical marijuana should be banned. Those supporting neighborhoods by voting to exclude recreational marijuana shops from Local Business zones were committee members Harry Friedman, David-Marc Goldstein, Angela Hyatt, Alisa Jonas, Steve Kanes, Fred Levitan and Lee Selwyn. Thumbing noses at neighborhoods by voting the other way were Ben Birnbaum, Clifford Brown, Carol Caro, Lea Cohen, John Doggett, Janet Gelbart, Neil Gordon, Janice Kahn, Bobbie Knable, David Lescohier, Pamela Lodish, Shaari Mittel, Michael Sandman, Kim Smith, Charles Swartz and Christine Westphal. Committee chair Sean Lynn-Jones did not vote. Vice-chair Carla Benka and members Dennis Doughty, Kelly Hardebeck, Amy Hummel, Mariah Nobrega and Susan Roberts were absent. Preventing needless burdens: The NETA medical marijuana dispensary on Route 9 is already in negotiations for one of the potential licenses as a recreational marijuana shop. Its success would leave only three licenses available. There are six more General Business zones to provide sites, leaving no need to burden neighborhoods near Local Business zones. A simple amendment to Article 17 at the 2018 Annual Town Meeting can keep recreational marijuana shops out of Local Business zones. VOTED: To amend the motion under Article 17 so as to change “Use 29A, Storefront Marijuana Retailers” from “SP *1,2″ to “No” for L (local business) districts. As of May 17, an equivalent motion is being proposed by Neil Wishinsky (chair of the Select Board) together with Betsy DeWitt, a Precinct 5 Town Meeting Member (TMM-5), Cynthia Drake (TMM-5), Scott Gladstone (TMM-16), Angela Hyatt (TMM-5) and Kate Silbaugh (TMM-1). After several years of experience with recreational marijuana shops in General Business zones, Brookline could review the results and see whether it might make sense to allow them in other places. This entry was posted in Business, Grade schools, High school, History, Licensing, Meetings, Neighborhoods, People, Public health, Regulations, Taxes on May 12, 2018 by Craig Bolon.